I have posted most of my holiday opshop buys now. Here I present the work that I bought new during our family and friends bike ride around Thames Waikato District. Nicole, Tomas and I joined friends from Whangarei and Auckland on the Hauraki Rail Trail a couple weeks ago, overnighting in Te Aroha, Waikino, Paeroa, and Waihi Beach. The first leg, Saturday morning took us from Te Aroha to Paeroa where we lunched at the Refinery, a cafe which has vintage and new pottery for sale. I saw some (ASP potter) Margaret Bray mugs there but missed my opportunity to buy as next time we passed they were closed. My afternoon plans were upset when I realised that the two potteries I really wanted to visit were separated from the rail trail by SH2 but more significantly the Karangahake River. Anticipating that I might buy from the Paeroa shops we had left the car there the night before so I made my best attempt to put the bike in the back of Nicole's Mazda2 and headed down the highway by myself with the hatch flapping in the breeze. I visited Mike O'Donnell's Tarariki Pottery in Old Reservoir Road but Mike did not appear and I felt a bit uneasy with the boot hanging open in a carpark I could not see so I did not linger. I had already bought one of Mike's mugs last year from Rick Urban's shop so did not stress about not making a purchase, although I was tempted because naturally Mike had a better selection than Rick. Next stop was Rahu Road Pottery, where Duncan Shearer and Charade Honey have relocated their woodkiln from Paeroa and built a new studio. I hoped to see some new work from the December firing Ev told me about but unfortunately all of Duncan's new mugs had just gone out to the retailers the day before. 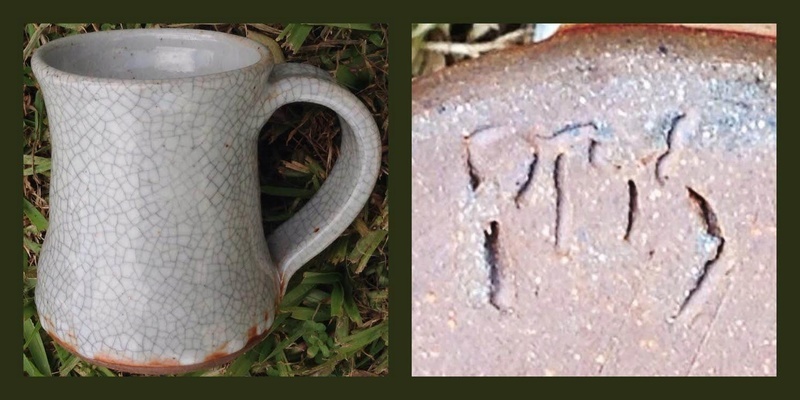 I had an enjoyable chat with Duncan, and learned a bit more about potting, and picked out an older mug from their previous location (marked "P" for Paeroa rather than "R" for Rahu Road). While Duncan disappeared up the hill to get some change I found a different mug, which on his return Duncan told me was Charade's work. It reminded me of visiting Darryl Frost's gallery just over a year ago and picking a mug by Sarah Harrison from his gallery. Fortunately on that occasion I did manage to also get a piece by Darryl which remains one of my all-time favourites. 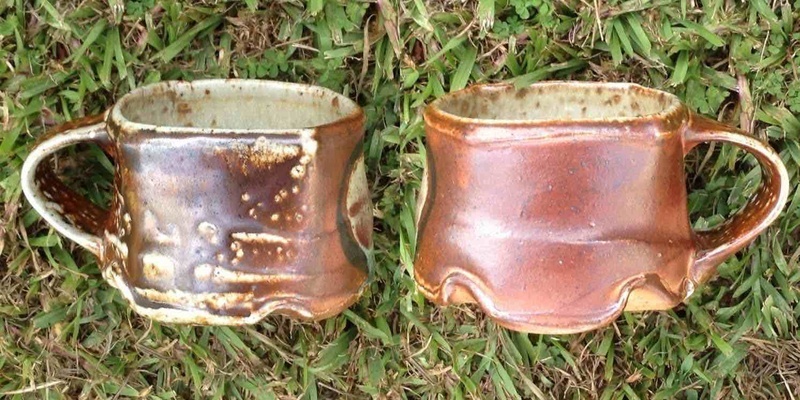 Wood-fired mug by Charade Honey, and Charade's mark. I did not ask Duncan if this was a December 24th piece but it certainly looks similar to items in their kiln shots. I am not so familiar with Charade's mugs so I don't know how it relates to earlier work. 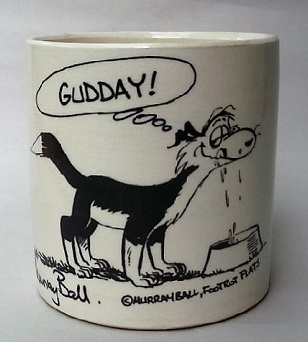 I have searched images of CH mugs and am I think my choice compares favourably to any I have seen. Duncan and Honey use a variety of traditional glazes including green and blue ash glazes: this is the latter. 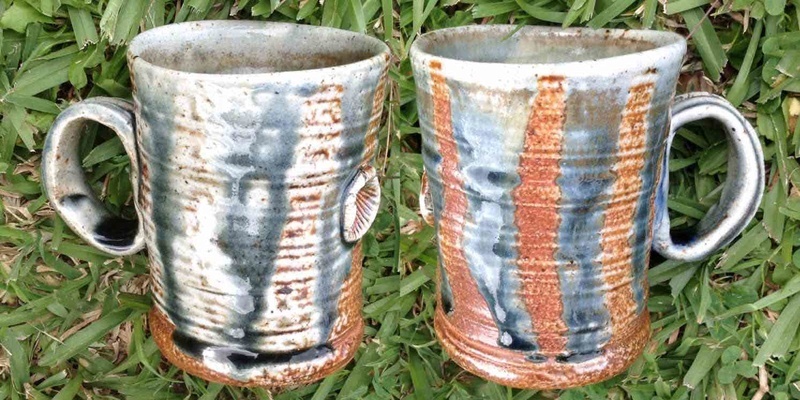 The glaze has run beautifully (all the way to the bottom of the mug at the handle) creating a beautiful set of stripes with the grey stoneware clay exposed on one side and an intense blush on the other. 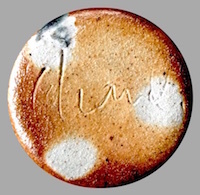 I know a few potters use shell impressions to decorate their work, but as Charade spent time working with Mike O'Donnell I'm wondering if this is a gesture to Mike. Before leaving Duncan supplied a piece of rope to tie down the boot lid and saw me safely on my way. I'd missed most of the Paeroa to Waikino ride so I parked up for a return bike ride through the tunnel and just happened to meet my fellow travellers at the eastern end where I threw myself in the water after some difficulty with the bike saw me riding uphill through the tunnel with my brakes on. The water was beautiful. I rejoined my group had a break from pottery until our trip back to Auckland. Driving in to Whangamata Nicole spotted the Pottery Studio where I met Peter Smith and Dallas Prinselaar. Their gallery was aglow with copper in reduction but instead I found a piece of Peter's shino to add to my collection. It wasn't until the next day that Finn told us we had just missed out on a massive sellup of NZ pottery from Whangamata's retiring retro seller. On Wednesday Nicole and I had a day out in Auckland visiting Te Uru to finally see the 2016 Portage entries, which I personally preferred to the previous year, and the Anne McCahon exhibition. And I bought my Duncan Shearer. Next stop was Te Toi Uku see Finn's new Crown Lynn displays. It was our first meeting with Finn but Nicole recognised him from a McCahon family photo at Te Umu! Nicole was surprised to see so little on display but as I had not returned since the opening Finn's new displays really wowed me. Just one more piece to post I think. Whew?